A loan of $1,000 helped to purchase a modern electrical sewing machine and other sewing accessories. This 28 year old seamstress is Gulnoza. She is from the Rudaki region. She is married and the mother of two children. Her husband is a good and loving man. He is a migrant worker in the Russian federation, where he earns money to feed his family. The children are young and in kindergarden. Gulnoza is also a loving and talented woman. She works with sewing women's clothing from her home. She has eight years of work experience. Gulnoza knows her work well. Her only income is from this business. 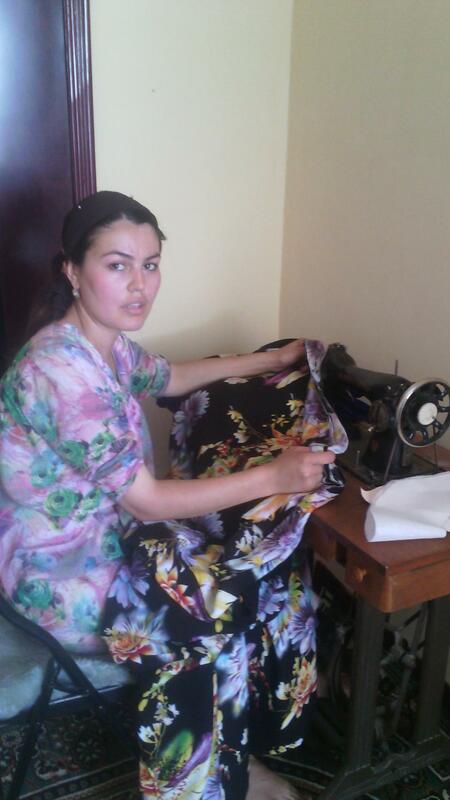 Gulnoza needs to purchase a new sewing machine, in order to speed up the work process and increase her daily income. She would like to purchase a modern electrical sewing machine and sewing accessories. Gulnoza works hard for her family's happiness. Please help her with the financial difficulties! Translated from Russian by Kiva volunteer Audhild A.. View original language description. 28 летняя швея Гулноза. Она из района Рудаки. Гулноза замужем и мать двоих детей. Ее Муж добрый и заботливый мужчина. Он находится на заработках в Российской Федерации, чтобы зарабатывать и кормить семью. Дети маленькие и они ходят в садик. Гулноза тоже заботливая и талантливая женщина. Она у себя дома занимается шитьем женской одежды. У нее 8 летный опыт работы, и Гулноза хорошо знает свою работу. Ее доходы только от этой деятельностью. Гулнозе нужно купить новую швейную машинку, чтобы ускорить процесс работы и увеличить ежедневный доход. Она хочет купить новую современную электрическую швейную машинку и швейные принадлежности. Гулноза старается ради семьи. Поддержите ее финансовыми трудностями! MDO "Humo" is a microfinance institution in Tajikistan that aims to support vulnerable and underserved populations living in rural areas through financial and consulting services for small businesses. Kiva loans are used by groups and individual borrowers to start and grow businesses and build brighter futures for themselves, their families and their communities. This is especially important in Tajikistan, the poorest country in Central Asia, where more than two-thirds of the population lives below the poverty line. Kiva’s partnership is supporting Humo’s work in rural areas of Tajikistan, a country that still ranks as one of the poorest in Central Asia. About 80% of its clients are located in rural areas, which are more difficult and expensive to serve, especially given severe electricity shortages during the winter months. Humo also has a lower average loan size than its competitors and has the largest percentage of its portfolio made up of small loans, which reaffirms its commitment to work with very low-income populations.